The walk in the Mournes Area of Outstanding Natural Beauty. The route follows the coastline from Newcastle around the promontory of Murlough. Lanes and farmland tracks lead inland, through the charming village of Maghera, and on to the town of Castlewellan. A circuit of Castlewellan Forest Park is followed by a mixture of rural footpaths and quiet country lanes heading towards Tollymore Forest Park. 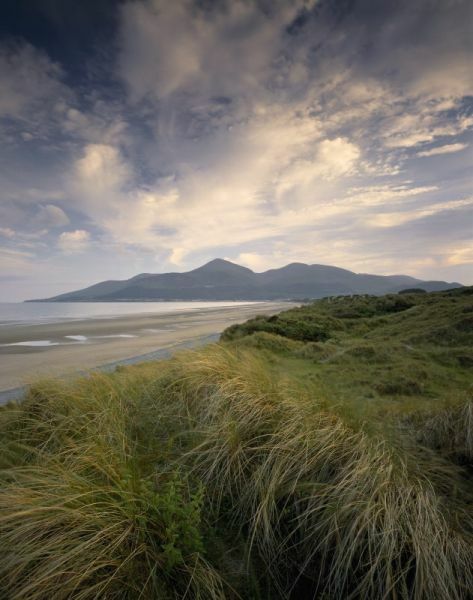 From the woodland trails there are splendid views of the Mournes and Dundrum Bay. Woods and parks lead back to Newcastle. The Newcastle Way is one of ten Waymarked Ways, a series of accredited walking routes that pass through some of the most beautiful scenery in the country ranging in length from 20 to 47 miles. These walking routes with waymarked posts have excellent infrastructure in place. Interpretation panels throughout the walks provide interesting information on local history, natural features and wildlife. The Waymarked Ways are: Antrim Hills Way, Causeway Coast Way, Cuilcagh Way, Lecale Way, Mourne Way, Moyle Way, Newcastle Way, Newry Canal Way, Ring of Gullion Way and Sliabh Beagh Way.